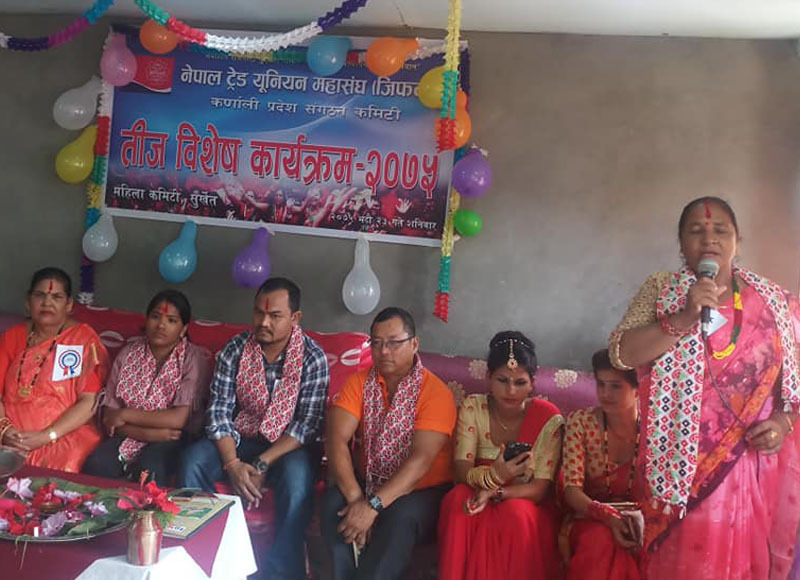 On the occasion of Teej festival women activist of GEFONT affiliates gathering has been concluded in Surkhet. Speaking as a chief guest women development inspector Ms. Bimala Biswakarma express her commitment to implement policies & program for the women development & empowerment. She further added, GEFONT has been raising the issue of Gender equality & GEFONT has played important role in Social, Economic development of Workers of Karnali province. GEFONT Karnali Province President Cde. Tejpraksah Jisi said “According to New Constitution women rights has to be ensured. Karnali province level Government has to make policy and program and implement for Women Empowerment & overall development. The Program was presided by Cde. Chandra Dhami. Cde Dhami briefed about GEFONT Gender policy & she also emphasis to implement GEFONT Gender policy in Karnali Province. She further added women have to celebrate Teej festival as a part of Social Obligation.